One of the advantages of having a group of blogs with over 5 million monthly visitors is the ability to draw correlations from over a billion points of data. Over the past two years, I have identified nine techniques that have dramatically increased the organic Google traffic to all of my blogs. The visual cheat sheet is first, and I give a detailed explanation below the cheat sheet for each technique. The title of your post plays the largest role in the click-through-rate (CTR) when your post shows up in Google results. The CTR and the amount of time spent on your site before returning to Google are two vital components of the Google algorithm. Google will typically display the first 50-60 characters of your title in the search results page. The best practice is to keep your titles under 55 characters. 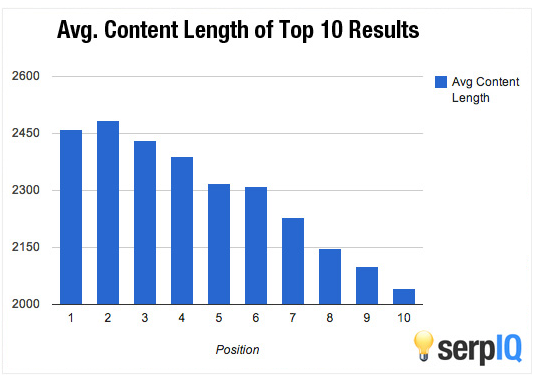 Blog post titles that start with a number have a 64% greater chance of rising to the first page of Google search results than any other title style. People like to click on articles that can quickly be scanned and consumed. The numbered article gets more clicks, and Google’s algorithm perceives the post as being more targeted than the competing results. Not every blog post will be able to have a title that starts with a number, but try to use a numbered title on 3 out of every 5 posts you write. 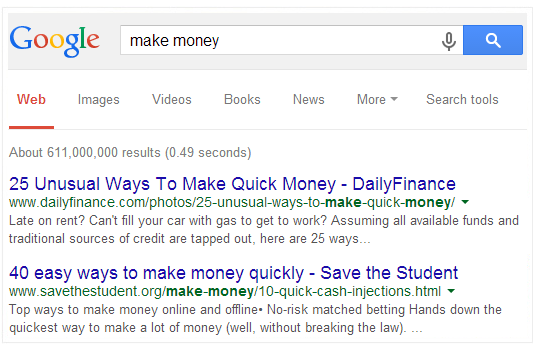 The Google results below illustrate two great examples of how to incorporate numbers into blog titles. If the keyword phrase you are trying to rank for is “blog marketing tips for photographers,” then you want the title to be “7 Blog Marketing Tips for Photographers.” If you are going to place additional words in the title, then add them before or after your target keyword phrase. Approximately 20% of all Google searches read the title and the description before clicking on their choice. This makes it important to craft a great meta description for each of your posts. Google will only use the first 150-160 characters from the meta description in the search results. One of the best techniques for improving CTR with meta descriptions is creating a tease with a partial sentence. The Google result below illustrates the perfect way to utilize this technique. A sidebar that is structured correctly can improve your Google rankings in several ways. Below are a few techniques that will give you the best results. By having your latest posts show on every page of your blog, it allows your new posts to be indexed fast and strong. Google’s algorithm will value your posts more if they are listed on every page of your site. Most recent posts widgets will have 5-10 posts as the default. I recommend using 15-20 because it allows your new posts to stay in the sidebar longer. This technique has consistently helped my new posts get a big boost on their initial indexed rankings. The best practice is to identify the highest traffic words associated with blog posts that you already rank between 3-9 on Google for. You will then create a featured posts section in the sidebar with links to each of these posts. I recommend using between 15 to 25 posts in a tabbed sidebar widget. The sitewide sidebar link will help push these blog posts to a number one ranking. If you are getting 1000 visitors a month from a #3 ranking, then a #1 ranking could easily get 4000 to 6000 visitors per month. Organic visitors from a #1 ranking also have a higher conversion rate to paying customers and email subscribers. The average word count of top ranked search results on Google is 2416. If you consistently have less than 300 words per post, then Google’s algorithm can actually penalize your site for having “thin” content. Not every post needs to by long form to rank well on Google. If the average post on Google’s first page has 600 words per post, then I would recommend writing a 900 word post for that keyword phrase. I personally write 50% more words than the average of the top 10 results for keyword phrases I target. Several of my new clients had blogs that were made entirely of posts that were below 500 words each. 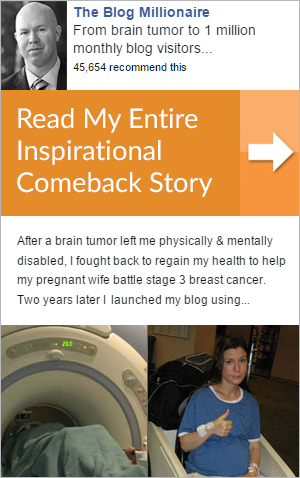 Within three months of writing one 2000 to 3000 word post per week, I was able to double the organic traffic of all of the website’s existing blogs. Once Google’s algorithm saw that the domain was consistently producing long form posts, it pushed up the rankings for every post on the site. Google tracks the time from the moment someone clicks out to your post until they come back to Google. If you can keep them on your post longer than the competition, then you will continue to move up the Google rankings. The formatting of your post plays the biggest factor in keeping new visitors from clicking the back button. Your paragraphs should be no longer than 7 sentences. This allows your entire post to be broken down into manageable bite sized chunks. Headers make your long posts easier to digest. If you use long tailed variations of the root keyword in the title, then it can also give your post a boost in the Google rankings. Numbered lists and bullet points make it easy for your visitors to scan the post. It also makes it easier for the writer to organize the content. The font type and size will allow your words to either flow beautifully across the post or appear bunched uncomfortably together. San-serif fonts are the preferred choice of most top blogs. The best practice for blog font size is 14pt-16pt with 130-150% line spacing. There is a reason why 99.9% of all books every written use black words on white paper. It is the ideal contrast for reading. You can be unique with the color of your logo, navigation, and footer. Just be sure to use a white background with black text for your blog posts. Topic targeted visuals can increase your average time on post by over 150%. Here are the three visuals that have the largest impact on average time on post. YouTube will have quality videos for almost any topic that you are writing about. It is also easy to identify videos that will deliver quality content to your readers by looking at number of thumbs up and thumbs down. I recommend using videos that are 3-20 minutes in length. For popular topics, SlideShare is a good option. I personally identify slideshares to use on posts by browsing the most popular section with filters for business, English, and the last year. This is the best way to quickly look through top-notch slideshows that are worthy of being in a blog post. I typically use infographics at the end of posts because they occupy a large amount of space and can disrupt the flow of the post. The best way to find infographics on your topic is simply to perform a Google Images search for your topic’s root word plus “infographic.” If the content is outdated, then you can add the current year to the search string. For each of the last four years, social signals has been the fastest growing component of the Google algorithm. Social signals include all of the shares from Facebook, Twitter, Pinterest, Google Plus, LinkedIn, etc. Google values sites that have naturally occurring social shares throughout the website. Here are a few ways to increase the conversion rate of social shares on your site. A floating share button on the left hand side of the post will produce over 70% more social shares than a static button. Unfortunately, most social sharing plugins are not responsive to mobile. Visitors using a mobile device make up approximately 40-60% of all traffic to blogs. Always test your social buttons on your mobile phone to make sure they work properly. Many social sharing apps allow you to program your social buttons to hide the number of shares until it reaches a certain number. Having a “1” next to your Facebook like button will actually increase the post’s bounce rate and decrease the average time on post. I recommend hiding social share numbers until they collectively reach 10+. Keyword research plays a 70% role in whether or not your post will ever get traffic from Google. This means you should spend more time on keyword research than all other activities associated with your blog. It is pointless to write a great 2000 word article on a topic that will never receive traffic. Here are two important techniques everyone needs to incorporate into their keyword research process. This is a real simple equation that will help you identify the words worth writing articles on. You just need to download your keywords into a spreadsheet, input the equation, and rank the “keyword value” column. This allows you to quickly find the keywords that have 100+ monthly searches with a strong keyword value score. Google’s algorithm has a component that ranks certain blogs higher for specific topics. This is based upon existing posts that are drawing significant organic Google traffic. The bullets below show you how to identify potential topics that your blog may be valued higher for. 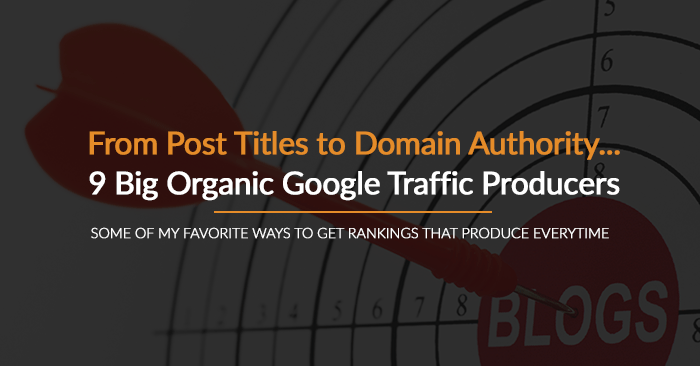 Take a look at your blog posts that get the most organic traffic from Google. Create 5-10 post titles from the phrases with the highest keyword value. Confirm that the new posts are ranking well over the next 120 days. Continue writing posts on the remainder of the keyword list. These are just a couple of broad strokes on keyword research. In The Blog Millionaire course, I dedicate an entire module to going over my secret keyword research formula that is responsible for ranking my clients’ blog posts on the first page of Google for over 50,000 different high traffic search terms. Every domain name has a score between 1-100. If you have a high number (35+), then you can go after keywords with greater competition. Domain authority is increased by having authoritative sites linking to posts within your blog. You can check your domain authority with MOZ’s Open Site Explorer tool. Here are a few ways to increase your domain authority. Infographics are consistently one of the top content marketing strategies for increasing inbound links. There are almost 10 million blog posts created each day, and there are less than 1000 infographics created each day. The chances that a reputable website with a high domain authority will use your infographic and link back to your blog are exponentially higher than your blog post alone. The easiest way to create quality infographics is using Piktochart. Once it is created, the best places to promote it are the Reddit Infographics section and the Visual.ly community section. Almost every news beat writer utilizes Google to research their topic. The most common search they use is associated with statistics. You can leverage this by writing 2-3 statistics posts each month on the popular topics leading the news cycle. During the Ebola outbreak, you could have written a post with the following title, “14 New Statistics on the Ebola Outbreak.” The post content will include the statistics in a list format. The post can also include your editorial comments on each stat. If you want to dramatically improve the chances of getting more inbound links, then create a custom infographic that visualizes the statistics. The growth section of The Blog Millionaire video course will walk you through how to implement and execute each one of these techniques with excellence. I will also be available to answer specific questions in the live webinars and through the private Facebook group.